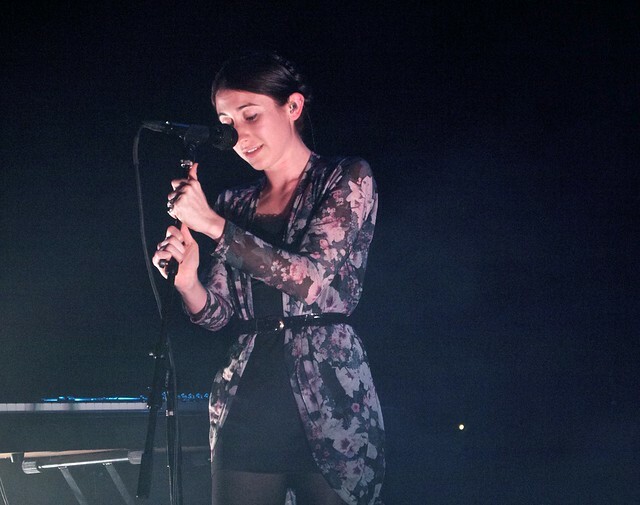 I don’t know if it was simply the mentality I walked into The Fillmore with or the acts as a whole, but the night with Interpol and opening act Hundred Waters was a somber night overall. The night began with a local act of sorts, the Gainesville natives Hundred Waters taking the stage before Interpol at approximately 8p.m. Lately, I’ve come across several opening acts that are either too similar to the opening act to complement them or too different that it made me question why the pairing was made in the first place. With Hundred Waters, however, their atmospheric, art rock style felt just right and established the vibe for the night. Lead singer Nicole Miglis’ sweet and soft vocals tied it all together, making it an ethereal experience as a whole with the orbiting light beams coming from the stage. The group especially spoke to me on a spiritual level with Miglis’ utilization of the flute in their particular style, an instrument I hold dearly to my heart as a flute player myself. It was a refreshing usage of the instrument, as you’d typically hear it in South Florida in Latin American music, where its sound is abrupt and short. With Hundred Waters, the sound of the flute accentuated the music as it flowed with each note alongside the guitars and electronics. 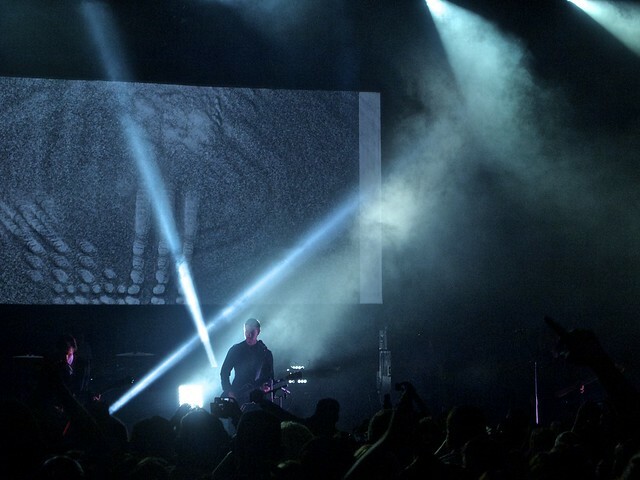 At approximately 10p.m., Interpol came on after several false starts brought on by the crowd cheering each time someone would come on stage during the sound checks. Looking slick in suits similar to the ones they’ve been seen wearing in recent promotional photographs, Interpol kicked off the set diving right into their latest material, playing “My Blue Supreme” off of El Pintor. 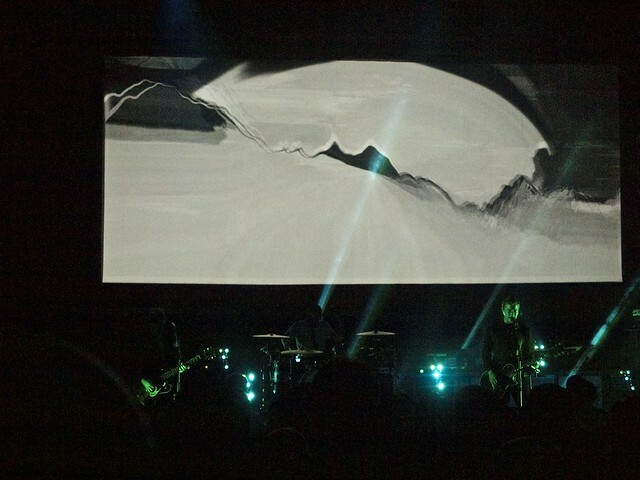 As is the natural order of things, the show in its entirety served as a platform for the new album, El Pintor, with the backdrop screen initially showing the cover art among other imagery. Quite ashamedly, I had not heard much of the new album until that night’s show. With most artists, given that a new album has been released, I typically wait to see them perform it live before fully judging the album if the opportunity arises within reasonable time. I do this mainly because the experience of hearing the album live is never quite the same as the recording, perhaps even far more superior. At least such is the case with most artists I’ve witnessed in concert. In Interpol’s case, the live renditions of the tracks played from El Pintor, and every other song for that matter, sounded no different than their recorded counterparts. I can’t really determine whether this is a good or bad thing in this particular case, as it at least shows that what you listen to on the recordings is exactly what you get while watching them live, perhaps validating the talent of the band as a result of their consistency. At the same time, I kind of expected the experience to be a little more special, a little more unique from simply hearing the recording itself. 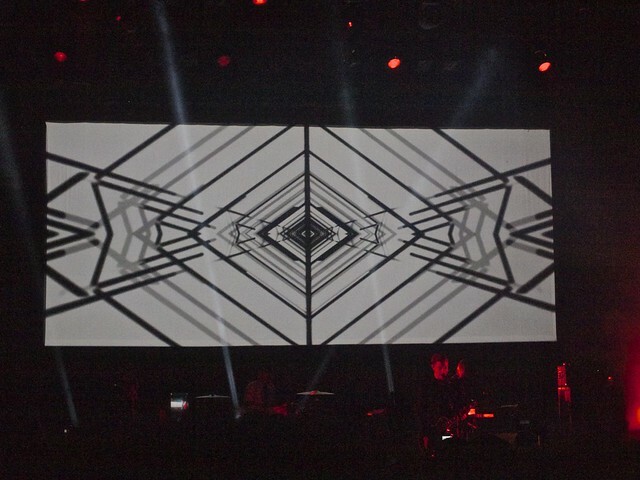 In Interpol’s defense, most of their songs typically don’t offer a lot of room for deviation and improvisation, a significant factor in making each performance unique. That’s not to say there wasn’t anything special about Interpol’s performance that night. On the contrary, it was almost everything I could have hoped for, hearing favorites such as “Slow Hands,” “Untitled,” “PDA,” “Leif Erikson,” and “Lights.” They honestly had me in an emotional rollercoaster, as I couldn’t contain all the feelings they made me experience in that brief moment. If anything, that is what made it a truly spectacular night: their ability to affect the audience so deeply–or at least just me. Perhaps it was my history with the songs played and how they have related to me personally as they were listened to during monumental points of my lifetime, but their spell wasn’t any less evident. If any band can make you feel as though you were in love and suffering from a broken heart at the same time, it is indeed Interpol. And that is what they achieved that night with this audience member that was simply in awe from beginning to end. This review reflected my feelings exactly. I’m glad I found it – it was a fun little throwback.